1115 - Arizona & US flags crossed uniform or souvenir embroidered patch. 3.125" tall X 3.5" wide. Patches sew or iron-on & are carded for a display rack for stores. 1104 - Arizona flag uniform or souvenir embroidered patch. 2" tall x 3" wide. Patches sew or iron-on & are carded for a display rack for stores. 1102 - ARIZONA large flag shield embroidered patch. 2 13/16" wide X 3.5" tall. Patches sew or iron-on & are carded for a display rack for stores. 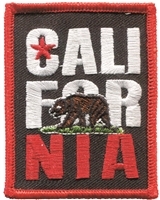 1116-01 - ARIZONA ROUTE 66 on black twill souvenir embroidered patch. 2.5" wide x 2.5" tall. Patches sew or iron-on & are carded for retail display for stores. 1101 - ARIZONA small flag shield embroidered patch. 1.75" wide X 2.5" tall. Patches sew or iron-on & are carded for a display rack for stores. 1120 - ARIZONA state shape flag embroidered patch. 2" wide x 2 7/16" tall. 100% embroidery. Patches sew or iron-on and are carded for a display rack for stores. 1116-39 - ARIZONA US 66 on white twill souvenir embroidered patch. 2.5" wide x 2.5" tall. Patches sew or iron-on & are carded for retail display for stores. 1106 - ARIZONA wavy flag ribbon embroidered patch. 1.5" tall x 4.75" wide. Patches iron-on & are carded for retail display for stores. 1152 - ARKANSAS large flag shield embroidered patch. 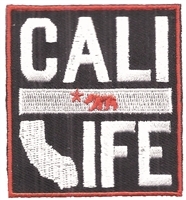 3 7/16" tall x 2.75" wide - Patches sew or iron-on & are carded to hang on a display rack for stores.